Program works only with files of icons ".ico". If you have an image of other format, you should transform at first it to a format ".ico" by means of any indirect program, and then to use it as a new icon for a replaced system element. 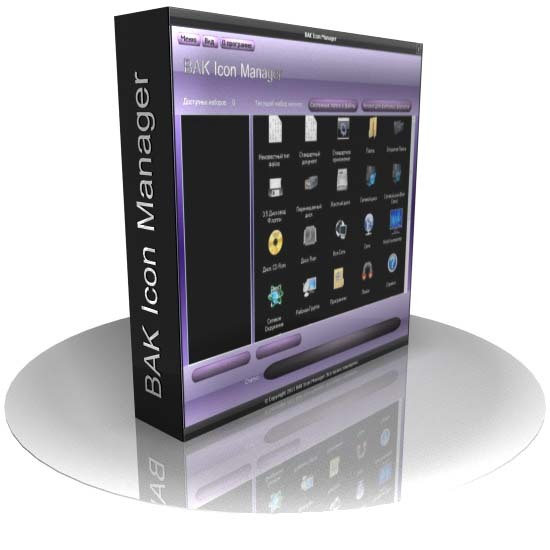 It is meant that the user already has files of icons on the computer which it would like to use in BAK Icon Manager. For single changeover of an icon in a program demo is it is necessary. The paid version already includes some ready collections of icons which can be installed on system. It is easy and fast method to make original appearance systems . Program Cost is specially installed such to be accessible to everyone. For program operation it is mandatory update setting Net Framework 4 is necessary. the Operating system: Windows XP. Download update from an official site of Microsoft. The test version is accessible to free downloading (1.0.0.2). 1. There is no possibility to work with " collections of icons"
2. It is possible to change only half of all icons with which the program works. To download the full-function version of the program it is necessary it to buy . In the test version of the program there is an executive file which does not need to be installed, it is enough to fulfill double click on it, and it is possible to begin operation with the program. At first check up presence of files of a format ".ico" on your computer. Icons are stored in this format. If you still do not have such files on the computer you can download them from the Internet, there is a set of free resources for this purpose. After loading program BAK Icon Manager displays icons which are installed at present on system of the user. To replace any it is enough to click on it the left mouse button. To appear a window of a choice of a new icon. Now it is necessary to find an icon which you want to use in changeovers of the old on the computer. For more convenient review install in properties of a folder "Type" => "Sketches of pages" . Select the icon necessary to you and push to "Open" . Also arrive with other icons which wish to change. After new icons are selected, push the button "Apply changes".